Good guys and bad guys in college basketball. It seems as if the college game at it's highest level is in a bit of trouble. I has been, in my opinion, for almost 2/3 of my lifetime. One of my first memories is in 1983... when NC State won the National Championship and Jim Valvano running all around the court. My dad was in and out of our den, pacing around as the game went on. Thinking back to that game and seeing some of the highlights today forced me to start making comparisons between the game then and the game now. I know that basketball has a dirty history. I'd be naive of me to say that the kids then were better people compared to the kids now. College athletics, at it's highest levels, have always been messy. I could take you back the old Dixie Classic that was held annually with the four big teams from North Carolina. NCSU, UNC, Duke, and Wake and four other schools from other parts of the country. It was held in Reynolds on NC State's campus between 1949 and 1960. The legacy of the tournament sort of lives on. A lot of high schools took on the tradition of playing a tournament during the holidays, which was when the Dixie was played. Anyway, the Dixie Classic abruptly ended in 1961 when it was found that some players on UNC and NCSU were point shaving. That's just one story. Let's not even get into the NBA in the 70s. Once cable got going though it seemed that college basketball cleaned up a little. But during the 90s got a little dirty again. Remember the UNLV and Michigan teams? Both of those schools are still suffering from what happened then. Something is different now. I was even part of it then in the mid 90s. A very, very small part, but still part. I saw some of the things that went on even at my tiny little D-III school. Some of it was frustrating even then but it wasn't enough to really say it was bad. Just hints of what goes on at much larger schools. What I learned was this: Either schools are committed to and guided by a strong set of values and mission. Education and development. Or they are just a sports school that pulls in money. The sports school is a rarer breed of place. It may seem that every school is this, but that is only because they are on television a lot. Same schools over and over. Within the "sports school" is where you get bad guys. In basketball it's the Kentucky's, UConn's and Tennessee's. You too Maryland. They are win at any cost type places. Tennessee had four players arrested a couple months ago driving around in a new Dodge Charger with some pot, open alcohol container and a fire arm with a serial number rubbed off. John Calipari runs the dirtiest of programs. He has left two Universities tarnished and under NCAA sanctions. He has two tournament records vacated at UMass and Memphis. After seeing Kentucky play this year it doesn't take an investigator to see he is up to his old tricks. 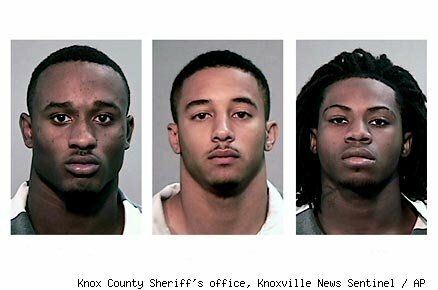 The only reason I'm picking on Tenn right now is because they are playing in the elite 8 with 3 of the 4 players arrested against a good school in Michigan State. Tom Izzo runs a good, mostly clean program. He develops men through his program. I find myself routing for clean programs and find it hard to understand why others may cheer for dirty ones. I understand it has to do with school history and tradition and all that. But what will be there to cheer for in the coming years? Ask a long time Michigan fan if the Fab 5 was worth is now. Hell, ask an alum who isn't a fan. Bah. It's an argument I cannot win as long as those schools keep winning. Also there are some many other points one could make on both sides and this argument usually devolves in to comments about race and poverty. We'll chalk this up nothing. Nothing at all.